Follow Kartika Putri through her Official App smarturl.it/kartikaputri. Download the free Kartika Putri app now! 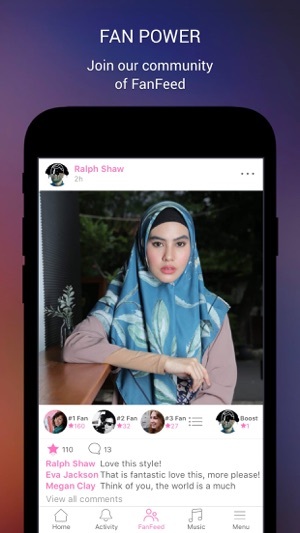 Stay connected to Kartika Putri on her official app. - Boost your comments with Superstars, become a Top 3 Fan, and be seen by Kartika Putri . - Follow Kartika Putri on social media. - Listen to the FREE built-in playlist and add more songs from your personal library, Spotify. Download the Kartika Putri app now and #BeSeen! We’ve just launched subscription service! Subscribers will get the exclusive subscriber badge to decorate their avatars and help them be seen. Subscribers will be able to access subscriber-only content as well as to post unlimited images and videos. The $1.99/month subscription fee will be charged through your iTunes account as an auto-renewable, recurring transaction unless you cancel your subscription 24 hours before the end of the current subscription month. You can manage your subscription, cancel it, or turn off auto-renewal at any time by accessing your iTunes account. When you sign up for the subscription service for the first time, you receive a 7-day free trial before your card is charged so you can try out the service at no cost. The free trial ends 7 days after you subscribe regardless of whether or not you’ve used the app. Any unused portion of a free trial period, will be forfeited when you purchase a subscription. Kartika Putri is famous presenter, host and actress who started her career as a sports presenter and a midnight quiz show hosted "Rejeki Malam" (2011). Kartika's career began to rise when she joined the TV show "Grandfather Narcissistic" (KKN). In the event she acted as Nanny, the nanny of naughty grandparents starring Indra Birowo and Ananda Omesh. From "KKN", Kartika began flooding job play on the big screen. She debuted through a horror movie titled "Grandma Gayung" then followed by "Mama Pulse Ask" and "Tali Pocong Virgin 2". Her name increasingly skyrocketed when she joined the comedy "Pesbukers" with Olga Syahputra, Raffi Ahmad and Jessica Iskandar. Its slightly "ndeso" character and Tegal's distinctive Together made it more popular with the public. Although often using Tegal accent, in fact Kartika is a native of Palembang. She claimed to learn Tegal's accent from her assistant when asked by one of the TV show producers to portray Javanese girls.